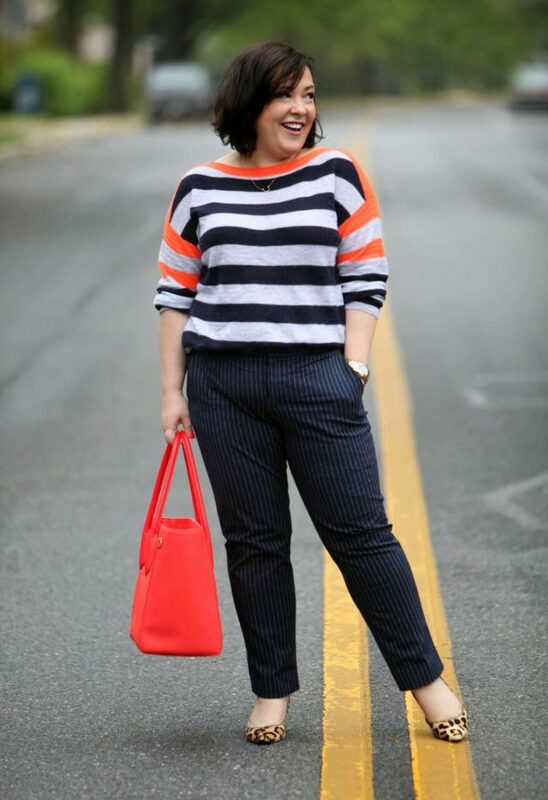 What's better than a striped top? 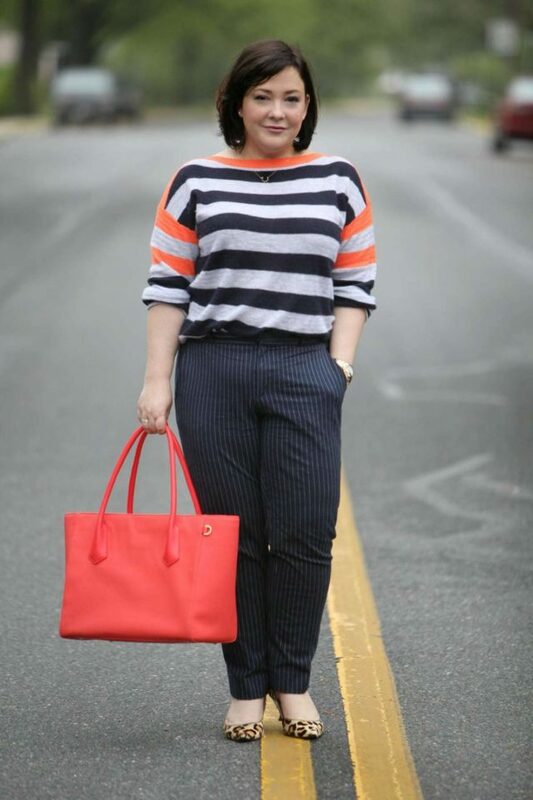 A striped top with striped pants! #Stripes4Lyfe! This is the cashmere sweater I mentioned in Friday's post and the pants from this post. If you follow me on Snapchat you know I wore this look last Tuesday to work. Whenever I can't figure out what shoes to wear with a look I always go to leopard and it rarely steers me wrong! A few of you sent me emails and comments after last week's What's In My Bag to see how the 15″ Dagne Dover tote looks near my body, if it's too big, and if it fits over my shoulder. As you can see it's not too big and fits quite comfortably over the shoulder even when full. Many of you have also reached out complaining how the current delicate necklace trend isn't kind to those of us who are larger or curvy. So many of the popular brands only carry 16″ chains; some carry 18″ but it's still too short for many. My solution? Etsy! This necklace is from Etsy seller bellezamia, the quality is excellent, the price cheaper than a lot of the trendy brands, and I could choose my chain length (this is 20″). Etsy is also my go-to for on-trend rings in sizes larger than 7 or 8. A variety of sizes and you get to support a small business or independent artisan? Win/win! Love this outfit and your hair! You look great. I love this outfit on you! This is pattern-mixing at its best, and perfect for so many settings. 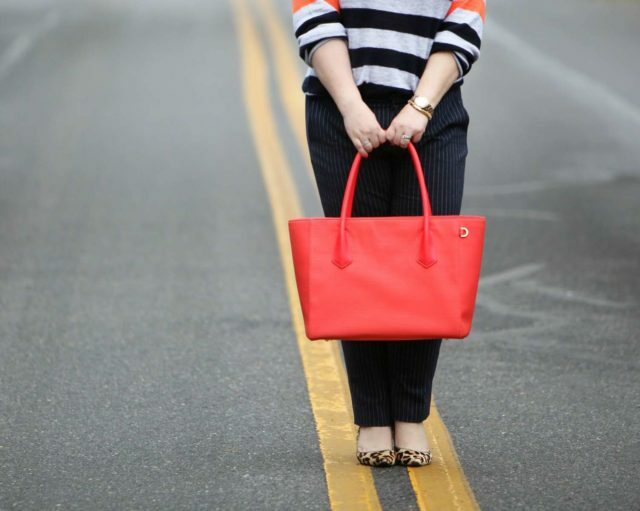 Very cute outfit, love the mixed stripes and the orange. Seeing those pumps made me toddle over to Lands End because I know their shoes fit me. I’d been stalking these little kitten heels for a long time, and they restocked my size. 30% off? Yes, please! What an awesome price for a great pair of shoes! These I bought years ago from Ivanka Trump and the lower heel is PERFECTION. Her shoes also fit me quite well. But my shoes are starting to lose the fuzz, the heels are looking battered and they’re on their third pair of FootPetals inside and just feel gummy and gross. When writing this post I went to find something similar to link to and was psyched to see what looks like the exact same shoe again available (what I linked above). I ordered a replacement pair. A kitten heel leopard haircalf pump is a must in my wardrobe, worn more than most anything else! I am jealous of your sweater 🙁 It’s sold out now! Awww shucks! I wonder if there’s some at a local store. And if not, J. Crew always has cashmere and stripes, I bet a similar one will be available in the future!